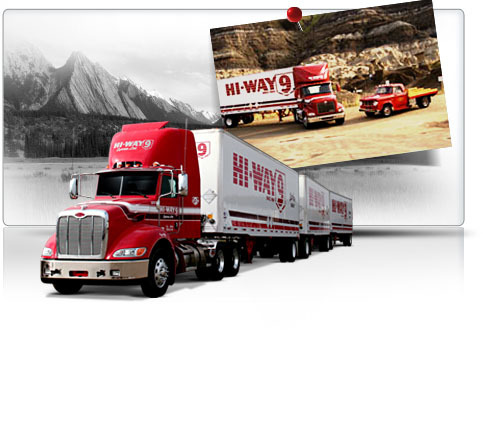 Rich in history and immense in opportunity, Hi-Way 9 Express Ltd. had a simple start with one man and one truck. For the May long weekend of 1969, John H Kohut was asked to haul a load of laundry from Drumheller to Calgary with his 2 ton truck. “Why not?” John asked himself. And thus began John’s vision to provide a service you could count on. Thinking fuller picture, after agreeing to transport the laundry, John then figured he would pick up freight and bring it back to Drumheller. The unique detail was delivering back the same afternoon. This same day service became very popular and overnight service was added between Drumheller and Calgary. By 1970 a third truck was included, then a fourth when Hanna and Oyen were added to the service list. By 1976 Hi-Way 9 had continued growing and an overnight service from Edmonton to Drumheller, Hanna and Oyen was also included. Growing at a steady pace in the 1980s, same day service became a corner-stone and a strong commitment to Alberta. Throughout the 80’s service grew to communities like Stettler, Three Hills, Trochu and more. The 1990’s saw expansion to Camrose, Provost and many other central Alberta towns. Through these years John’s children-John Jr, Heather, Dean and Darrell, came to work alongside their father, helping lead this company through growth and change. "To offer a service you can depend on and do it better and different than our competitors". The original Hi-Way 9 Express Ltd. The Group prides itself in supplying its 450 plus employees with the most advanced equipment and technology available in order to service their customer and their first class facilities are base to over 900 pieces of equipment. Offering same day service, overnight service, temperature control service along with flat decks and dry vans to over 300 communities, as well as warehousing, logistics, and specialized load services, Hi-Way 9 Group of Companies is proud to be “The Carriers That Care” for its customers, its team and the communities it serves.